The Cannondale Slate encourages the rider to take on any terrain they might desire - be it road, gravel, mud or trail. Yes, we are talking about the ‘dark side’ here, but keep in mind this could be the one bike that truly does it all. For increasing numbers of roadies the yearning to head beyond the tarmac has become stronger and the market is certainly taking note by developing more bikes capable of exploring more than the bitumen. In essence these bikes scream FUN! This bike fights what’s defined as ‘normal’ as it sits high on the ‘alternative’ scale. 650B wheels are one of the drawcards as well as a Lefty suspension fork. So, you can see how there’s been several internal discussions about which publication the review would be featured in. I’ve been gaining vertical metres since moving to Titirangi, in the Waitakere ranges, a land of endless hills! So, intially having the lightest bike available was on top of my list. However, in recent times I’ve been searching out gravel paths, fire roads and the odd track, so, I need a bike that can take on more. So, does this bike stack up and instill confidence when tackling the odd stair on the walking track? As mentioned earlier the Slate uses 650B wheels with 42mm wide tyres to create an outside rolling diameter similar to a 700×23 (normal road bike wheel/tyre size). Throw in a very short travel Lefty fork and tuned alloy frame and you’re ready to take on the rough stuff. The stays are designed to bend under load – similar to leaf springs. This provides a ‘micro-suspension’ for the back end of the bike. 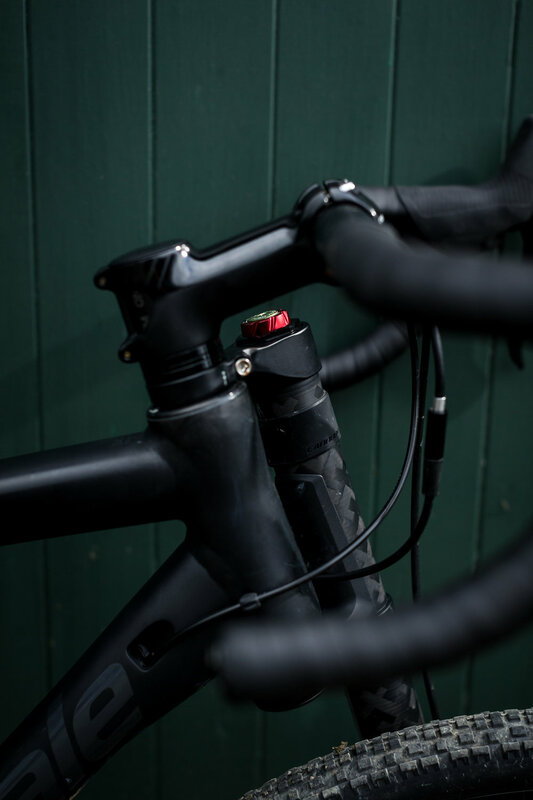 The frame also utilizes a BB30A bottom bracket, 27.2mm seat post diameter and 142x12mm thru-axle that threads into a replaceable hanger. The Slate’s frame reminds me of the mountain bikes in the early 90s. However, it has new generation flair with internal routing, shaped stays, bi-oval top tube and matte black paint with anodized aesthetics that really set it apart from any other bike currently on the market. The Slate’s head angle is 71º for size Small, and 71.5º for M thru XL. That’s around two degrees slacker than on Cannondale’s SuperSix road bike and this angle offers stability at speed and boosts handling on those loose gravel roads we have in NZ. 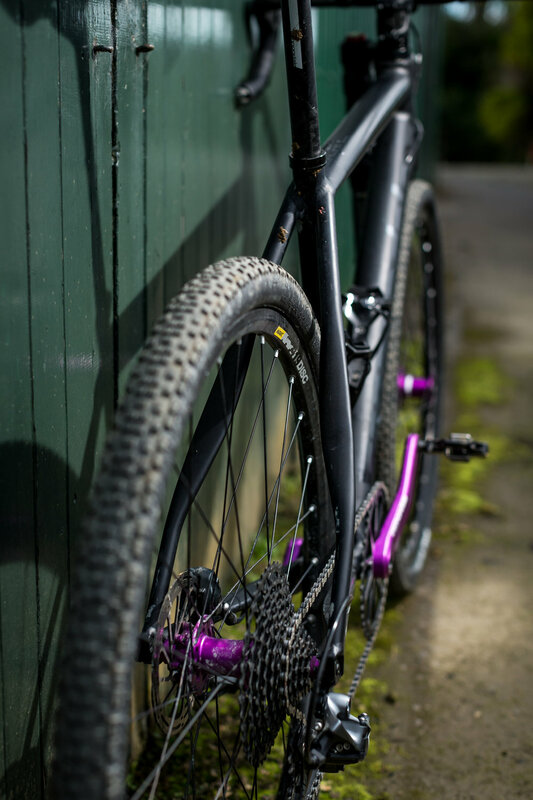 The rake is 45mm, which helps keep the bike upright on the trail. Moving onto the suspension, the Lefty Oliver has only 30mm of travel, but when combined with the big tyres it’s remarkably effective. The travel isn’t jerky either and rolls across any terrain ultra smoothly. If you don’t want the shock activated (such as when you’re riding on the tarmac) you can easily push the button lockout. But, as soon as you head down the garden path simply push the button to employ the travel. I’m not going to lie – the Lefty fork looks wacky; however don’t knock it till you try it! The Force CX1 build features Hollowgram cranks, a 44t chain ring and is smattered with other Cannondale branded goodies. Our test rig has Surly Knard tyres and a Zipp Service Course SL stem. The Fabric saddle is a comfortable touch point. The 1x transmission is often found on high-end mountain bikes and is making ground in the CX and gravel scene too. This system is exceptional on the rough stuff and gives you one less thing to have to think about. SRAM’s robust DoubleTap shifting along with their ultra-reliable hydraulic flat-mount disc brakes rounds out the bike build. I can promise you that I have put this bike through its paces; from dusty dirt trails to gnarly gravel forestry roads and almost everything in between. More often than not I’m testing my limitations more than the bike’s as I search to put the bike outside of its comfort zone. One testing moment was riding on a Grade 2 MTB trail pointing the bike down a rather steep descent. With the steepness of the trail it would have been better suited to a dual-suspension MTB, though thankfully the Slate got me through unscathed. However, I could’ve done with a little more slack but, it’s probably a bit too much to ask of a drop bar bike. And, you’d certainly compromise on handling on the tarmac and gravel. Being aboard the Slate makes you feel like a kid again. Yes, I know most bikes offer this trait but there’s real joyfulness when riding this bike. The ablity to jump on and off the curb whilst cruising along on a regular road ride makes me smile. This playfulness extends to boardwalks, paths and any other park or bush that can link roads together. And herein lies the strength of this versatile rig, you’re not held back by one discipline, you can mix them all together. The Slate’s geometry enabled me to descend technical gravel roads at good speed whilst still being in the drops. And, when hitting the flats across heavily corrugated country roads the fork came into its own absorbing and ironing out the ruts. The ablity to lockout the fork on-the-fly meant that I could still keep my pace on the climbs without losing my power through the suspension. 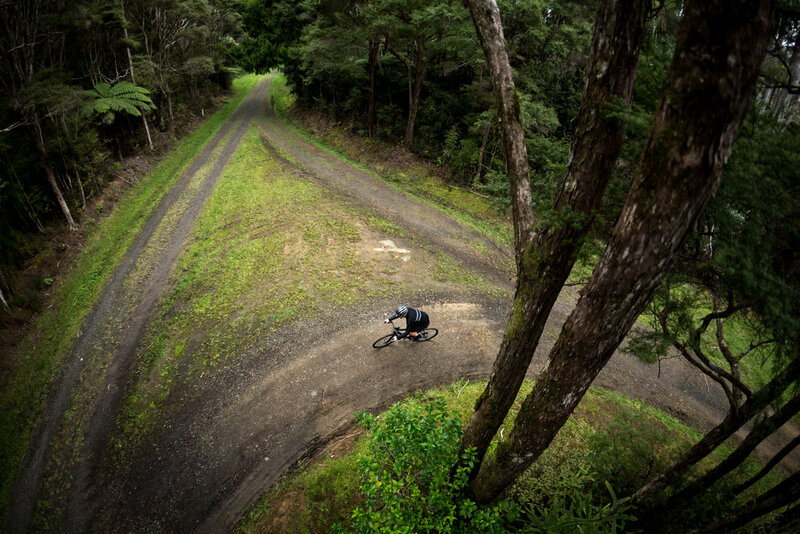 The transition from tarmac or gravel to singletrack offers endless adventures. And, from the riding I’ve done with the bike one doesn’t compromise the other, this bike’s capable across most terrains. Now, I do think that the bike fitted with a dropper post could be a good idea (definitely out there). But, getting rid of the seat on techical trail descents would be ideal and make me want to ride it on more trails. The smaller wheels do take a little more to get up to speed and the bigger tyres emit a constant hum. However, point this rig round a sharp tarmac bend and it can rail like any other road bike. It does lack top-end ‘zap’ but that’s not really what this bike’s about. I like the bold approach of the Slate and how it bucks what’s normal. This is not one bike nor the other; it’s all of them in one. It’s the ideal rig for our rugged landscape and the amazing cycle trails that the Government is pouring millions into. And as it’s not held back by skinny tyres or a slammed position, the opportunities for rides are endless. It’s not going to be for everyone, and may not replace your road bike, but it’s certainly a contender for those searching for adventure and more. I will be sad to give this bike back as it has allowed more adventure to creep into my cycling - whilst still keeping it FUN!